the dubcore series continous, now on burning 12inch red vinyl. four tracks by celsius made in 1995 with protracker for amiga 500. ruff to the bone jungle to thrill up the massive. too fast and come quick are shaking up mashup tracks, the mob on the flipside is a more rolling drum and bass jungle tune and take n over to the end is a small wild bashing stomper. these tunes amazed me since the ninties, as i loaded them from aminet where they first published as .mod files. now i am proud that i can now offer them here on vinyl the first time. 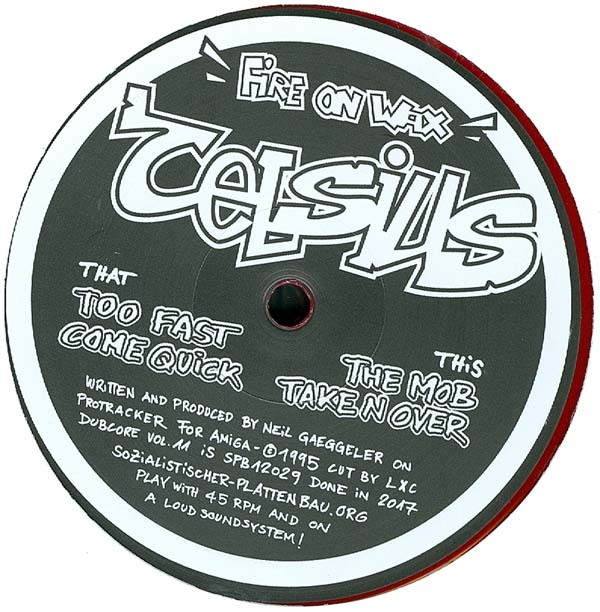 fire on wax is the first of two releases planned with celsius on the dubcore series. This is a 12inch, Products Artist Celsius. Bookmark the permalink.